Julia Roberts and Clive Owen have Duplicity when their crime caper lands in theaters March 20. In honor of Roberts and Owen criminally good chemistry, we have compiled 10 top movie crime couples. From the famous pairings of George Clooney and Jennifer Lopez to the iconic coupling of Warren Beatty and Faye Dunaway, Hollywood royalty is well represented when it comes to having partners in crime. Their resonance has only begun on screen, but Clive Owen and Julia Roberts have perfect crime chemistry in their latest, Duplicity. George Clooney and Jennifer Lopez defined smoldering couples on screen in their unforgettable version of Elmore Leonard’s classic novel, Out of Sight. The scene with Clooney and Lopez cramped in the trunk of a car alone would be worth the price of admission. Toss in a compelling story ripe with crime, daddy issues and old fashioned greed, and Out of Sight is impossible to get out of your head. 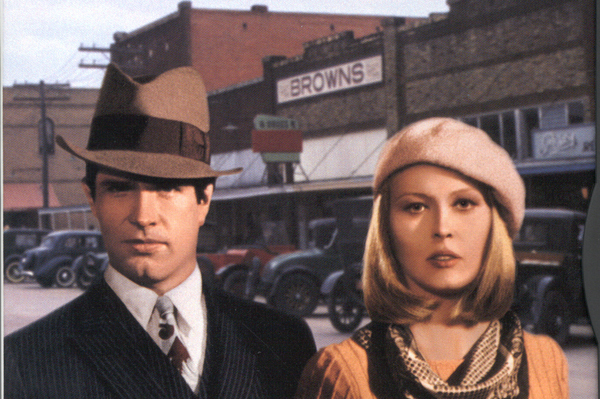 In the ’70s, Warren Beatty and Faye Dunaway were the rage as the true life couple Bonnie and Clyde. The notorious couple made their way through Depression-era Middle America robbing banks and amassing a fan base in the process. Their death, as detailed in film, was at the time the most violent scene filmed in history. Bonnie and Clyde’s resonance across pop culture is unmatched. From Jay Z and Beyonce’s first collaboration Bonnie and Clyde ’03 to a million imitators over the years, Beatty’s Clyde and Dunaway’s Bonnie are purely iconic. 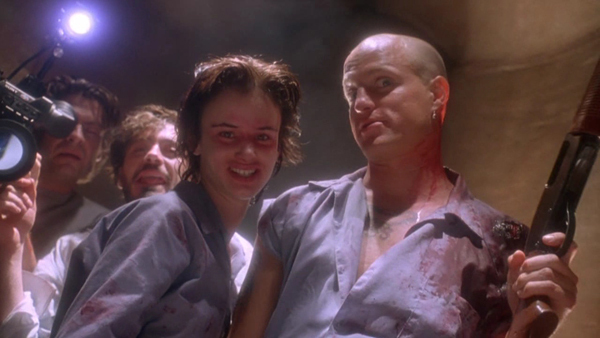 Frightening to their core, Juliette Lewis and Woody Harrelson rocked movie goers with Oliver Stone’s disturbing vision of Natural Born Killers. Harrelson and Lewis’ crazy chemistry painted a picture that its heart showcased a crime couple living a love story. Hardly your traditional Hollywood love story, but in the hands of Stone, Harrelson, Lewis and a cast of crazies, Natural Born Killers gives us one of cinema’s best crime couples. Oddly compelling, The Professional (known in many circles as Leon) is an intense film from Luc Besson that put Gary Oldman at the heart of its publicity promoting the film. The star is really the titular character played by Jean Reno who, unwillingly, is pulled into a family crime disaster scene that would make Tarantino proud. Reno emerges to rescue Portman and the pair are off to defeat the people that murdered Portman’s family and ruined Reno’s day. Where Reno shines is his subtle performance as the hit man with a heart of gold when it comes to protecting the innocent little girl played with youthful abandon by Portman. Sense a theme here with George Clooney and Julia Roberts? Whereas Roberts smartly smolders with Owen in Duplicity and Clooney with Lopez in Out of Sight, together in Ocean’s 11, they are the study of cool. Roberts was easily ‘one of the guys’ in Steven Soderberg’s epic tale of Las Vegas crime gone hi-tech. Her pull towards Clooney’s character throughout the film is what drives the plot towards its thrilling finish. 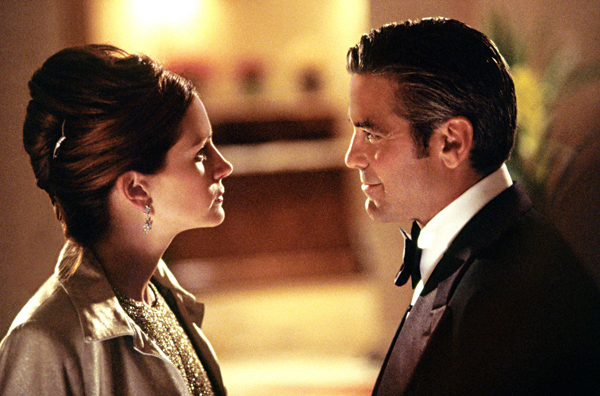 When it comes to couples in crime, Roberts and Clooney hit the jackpot. The early ’80s was littered with terrible, poorly made crime films. Leagues beyond the those films and in a league by itself within the entire genre, Scarface arrived in 1983 and became a cultural icon. 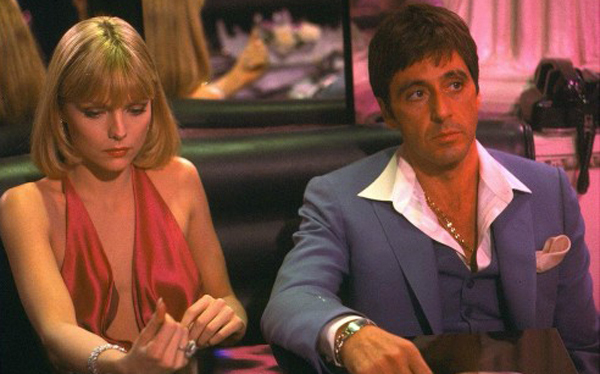 Al Pacino’s Scarface had a true little friend and that was Michelle Pfeiffer. Scarface is what truly introduced the world to Pfeiffer and as she perfectly dueled with Pacino across Brian DePalma’s crime epic, Hollywood discovered an actress that would still demand accolades two decades later. Faye Dunaway had quite a run herself in the ’70s with the crime couple pairing. In Chinatown, Dunaway was pure ice across from Jack Nicholson’s passionate private detective. Along the way, audiences were shocked at the “almost” true story of how Los Angeles grew into the city it is today. Nicholson is at his ‘what happened to me and who’s going to pay for it’ best in Chinatown while Dunaway’s characterization is one for the ages. After a terrible secret is revealed, it is only Dunaway through her performance that makes the truth even remotely bearable. Although DeNiro’s casino boss would be dragged down by Sharon Stone’s gold digger, to watch him put his trust in this woman over and over again is what makes Casino such a tragedy at its bare bones. Casino, as directed by Scorsese, is practically Shakespearean in how its hero has a tragic flaw that sits in his heart. Sharon Stone wowed critics with her hurricane of a performance as DeNiro’s romantic foil. Aiding in abetting in the slow destruction of DeNiro’s casino boss is Joe Pesci and James Woods in one of the great films of the ’90s. Speaking of great films by Scorsese, in Goodfellas, Ray Liotta and Lauren Bracco had more than perfect accents. Liotta and Bracco had the most incredibly true gangster story to work with under the guidance of Scorsese. Liotta is a crime kid who makes his way through the syndicate until he is among the top Mafioso’s in the Northeast. Meeting Bracco, Liotta’s character begins his journey that by its conclusion has him living like “any other couple of bastards” in witness protection with Bracco and family in tow.